We all collapsed in giggling heap on the floor. Finally Flo got up. We looked at her and realized it was time for the fun to be over. It was 1946 and our Daddy was away in the army fighting someone called Hitler. Our mother was sick, we were told, and unable to take care of us. At four years old, all I knew was that I wanted my mommy and daddy. We had been placed in an unloving foster home but were allowed to visit Grandma, Grandpa, and our teenage Aunt Flo on most weekends. I began sobbing. Flo took us by the hand to begin the long walk to the bus that would take us back to Mrs. Muran’s house, the foster home. 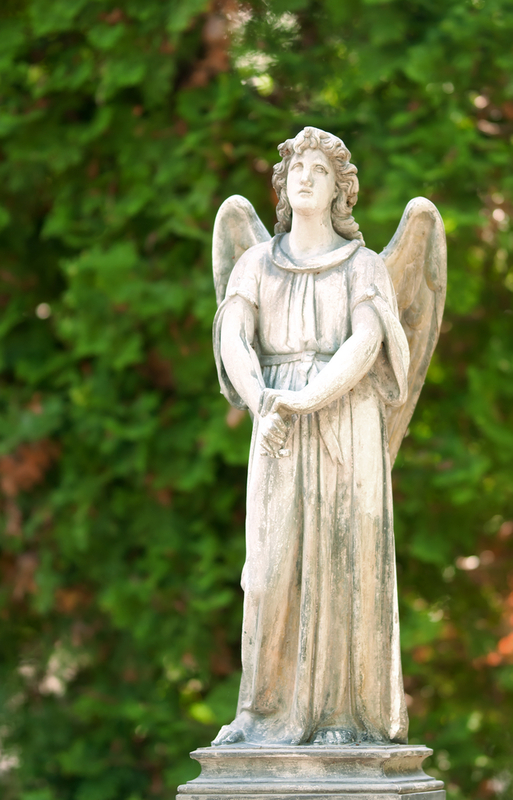 “Garden Angels don’t come to Mrs. Muran’s house,” I told her one night. “Oh yes they do. Your angel goes everywhere you go,” Flo told us. As we walked to the bus stop, Flo talked about our Christmas plans. We would go to Mass at St. John’s Church and see the pretty red flowers and candles around the altar and hear the choir sing “Away In A Manger” and “Silent Night.” Then she would help us get ready for bed in our new pajamas, tell us the story of the first Christmas, and sing Christmas carols and also our favorite Irish lullaby. Christmas morning we would see the Christmas tree all decorated and maybe Santa would even leave presents for us. When Christmas Eve day came all the other kids at Mrs. Muran’s left one by one. It was snowing hard and we stared out the window waiting for Flo. Then we saw her go around to the back door. We were so excited, but Mrs. Muran chased us up the stairs and told us to go to the attic. That’s where we slept. We went only part of the way up and stopped to listen. “I came to pick up the kids,” Flo said. “Those brats ain’t goin’ nowhere. Mostly not with the likes of you. All’s ya do is spoil ‘em rotten,” Mrs. Muran raged. “What do you mean? It’s Christmas and their mother said we could take them,” Flo said in a strained voice. “Well you can at least give them this one present,” said Flo, her voice increasing in volume. Mrs. Muran tore open the wrapping paper from the package Flo handed her. “I love you,” Flo called, then yelled at Mrs. Muran, “You mean witch. How could you do this? It’s Christmas.” Flo was crying. I never saw her cry like that before. Mrs. Muran threw the pajamas at Flo and slammed the door shut. “Yes ma’am,” we said. We were glad to have the blanket. It helped some, and Sparky pulled me closer to help me get warm. “Jesus will come with His angel. You’ll see,” I said. “Shh, go to sleep,” he whispered. I went to sleep for awhile, but soon awakened. It was dark and cold in the room, but light was shining in the window. I got out of bed and went over to the window and looked below. I could hear someone singing. It was soft, but I could hear her. “What are you doing?” Sparky whispered. “Shh, can’t you hear her?” I answered. We knew Flo’s voice. Suddenly a second voice softly sang, “Away In A Manger” as Flo sang the Christmas lullaby. We peeked out and saw Aunt Flo smiling up at us, but no one else was there! The light from the moon was shining on the snow and a bright star was in the sky. Flo waved at us. We felt warm even though the room was cold. We knew the tiny Baby of Bethlehem was with us, sharing His love. We fell asleep listening to the singing with the old blanket wrapped around us lying there by the window. “Yes Mrs. Muran,” Flo said and grabbed our bag. Flo winked at us, and held a finger up to her lips so we wouldn’t talk. Then she took our hands and we all ran down the driveway, to the walk and up the corner to catch the bus. We didn’t know what Mrs. Muran had seen, but we knew what we had seen and it wasn’t a ghost. “Baby Jesus came last night, Flo. He brought two angels,” I told her. “Who were the two angels?” Flo wanted to know. We did all the things Flo told us we would do on Christmas, but the best gift was our new home with our grandparents. Our grandparents raised us and to this day, fifty years later, Flo is more than our aunt: she is an angel to us.